How Bourgeois: My Top Four Tips for Getting the Nicest, Most Soft and Shiny Texture as You Grow Out Your Gray! Hiya my silver haired friends! I thought it was time for a little gray hair update and a talk about texture. Whether you're straight haired, curly or wavy, coarse or fine, everybody's hair needs a bit of TLC in the texture department, especially when going gray. Have you heard it said too? That GRAY HAIR HAS A COARSER, MORE WILD TEXTURE? I remember reading that for the first time and becoming very WORRIED! Was my hair going to become a mop of wiry grays!? Would they stand up on top of my head, like I was touching one of those static electricity balls!? Would my hair be rough and not nice to the touch!? These are all daunting questions, ON TOP of the stress of just plain old growing out you grays! I am sooooooooo happy to tell you, that not only did my gray hair NOT grow in more coarse, it's MUCH softer and less frizzy than it has ever been in my adult life! Everybody will have a different experience, just like everyone of us starts with different hair. 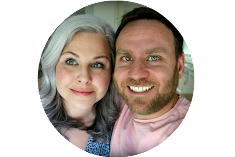 I can't promise you, that you too will have as positive an experience as I have, BUT, there are many things you can do to protect and nourish your hair as you transition to gray. Often times, you end up taking better care of your newly gray hair than you ever did before, in turn giving you great texture! Personally speaking, my hair has always been thick and a little on the more coarse side. So, any difference in texture in my gray hair has been less noticeable, if noticeable at all! Also, after years of coloring my hair, it was so dry and so frizzy, that once I stopped, my new hair growth was many times softer, smoother and hydrated. Cutting out the chemicals and becoming more aware of conditioning my hair, gave great results. Sometimes I can't believe the difference. So, without further ado, here are my top four tips for helping your hair to be the softest, most manageable hair no matter what type you have! Tip #1. Check back in, what kind of hair do you have now!? Our first tip is pretty general and there's wiggle room in there, but it's a good guideline to start with. If your hair is curly, you're going to cause damage and frizz by a daily effort to straighten it! And vice versa, if your hair is straight, curling everyday with heat will eventually effect your texture. I suggest taking stock of what your current hair is like. You'd be surprised, sometimes your hair can change! A great example of this is ME! I was slightly curly-haired as a kid. As I became older, my hair grew curlier and curlier. In my teens and 20's I had a great curls. After my son was born, the curl loosened, until it became more of a scraggle. This can happen for a variety of reason. Today, left untouched in the drying process, I'd say that I'm at the point of a nice wave. I posted recently that I thought I should start embracing my natural curls again, to cut back on hair damage. And that's just what I did! But, I was surprised to find that coaxing my hair into curls was taking so much more effort than before, and the curls were half of what they used to be. I had to stop and realize that: MY HAIR WAS NOT EXACTLY CURLY ANYMORE!!!!! Isn't that strange? Because it's been so long since I tried to air dry and coax my curls, I failed to understand that the texture of my hair had changed! After lots of reading up on the subject and changing my hair care routine, I've come to find the best (and easiest) way to embrace my more wavy me. As an added bonus, my hair feels softer than even before! The point is again, simply by taking stock in what your current hair is like, and then trying to work within your range of natural hair style, you'll be inflicting less damage on your hair, therefore giving it a much better chance at being healthy and soft. Tip #2. 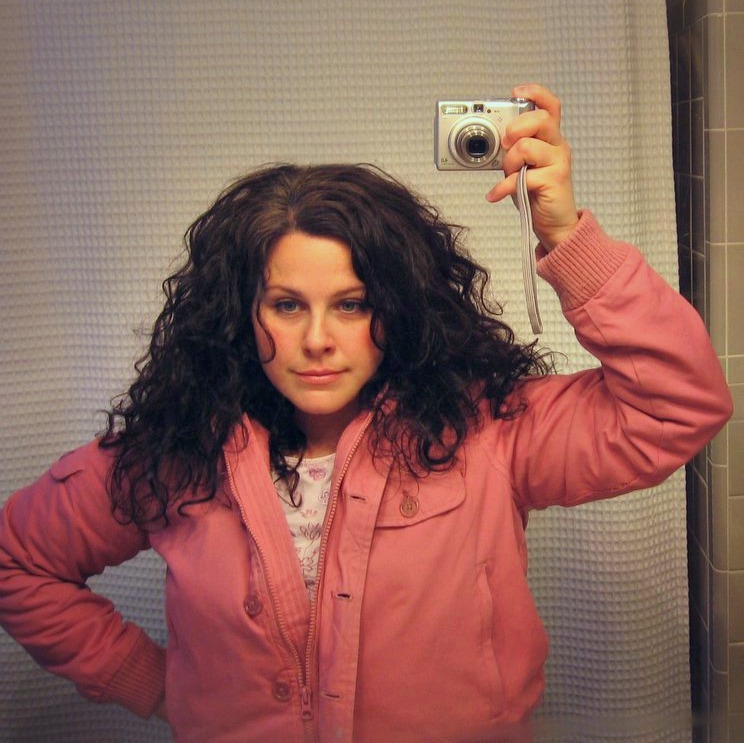 For all you curly and wavy haired girls - LEARN about hair care for you hair type! This is really huge. There is SO MUCH to learn about caring for your curls and waves. Our hair is ALREADY different because it's gray, but being curly adds another layer of complexity. It's a fun topic though, and easy too. It's worth looking into. Alas, my curls changed over time, and as I mentioned before, I'm pretty much a wavy-haired gal now. I did however, started researching the different ways that I could try coax those curls back, before I realized I was wavy. The following information is essential for both textures, curly and wavy! 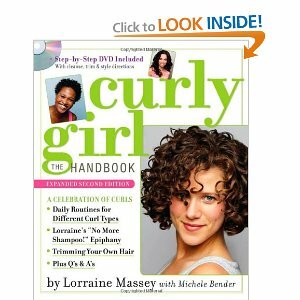 Curly Girl: The Handbook! This was cute, a quick read, and full of helpful helpful tips. I learned about tossing out even my all-natural, organic shampoos, for conditioner only, or a non-sudsing "no-poo" alternative to help with moisture. It went in depth on how to wash your hair without breakage, and also the best ways to air dry! I learned about conditioning my hair and about styling products. It was very interesting. So, bottom line, if your hair is anything but straight, know about the additional ways you can care for and style your hair. SUPER effective and fun! Tip #3. It's ALL about theMOISTURE. Pick your products well! No matter what your hair is like, we all need moisture in our hair, ESPECIALLY those with gray! Gray hair can easily become dry and brittle. We need lots of conditioning. The trick is, is to condition our hair, but avoid heavy build-up, which can weigh our locks down and cause a yellow cast. It's a balancing act. My own strategy is to use products free from stripping chemicals, that really pack a moisturizing punch. I try to find things that give the most softness, but feel the least heavy. When I start to see build-up, which just looks like a tinge of yellowing on my white hair, I use a blue tinted or clarifying shampoo and conditioner one or two times in a row. Here are two moisturizing products that I've recently found and highly recommend! 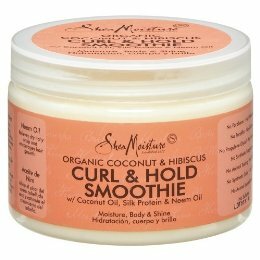 Shea Moisture Coconut and Hibiscus Curl and Hold Smoothie ! "smoothie" helps to smooth away frizz and hydrate. I've found that a little goes a long way. (Watch out though, too much can make your locks feel a bit heavy.) It smells nice too. Oh! And it is organic and full natural ingredients. Win-Win! I have also been using their Coconut and Hibiscus Curl and Hold Conditioner. Like it's "smoothie" cousin, this wash out conditioner really helps. It keeps my hair feeling soft and manageable! Tip #4. Heat is the enemy!!!!!! I've mentioned before that I came into this whole exercise of "going gray", with the preconceived idea that in order to look good, grays needed to be sleek, smooth and straight. I was really wrong. I don't know why I even thought that. I think it had something to do with silver hair reflecting less light. Straight hair is usually more light reflecting than curly hair, so I put two and two together. I was incorrect though, with good care, you really can make any style of gray look just lovely. Straight or curly! I think one of the most important things you can do to help keep your hair feeling soft instead of brittle, is to use as little heat styling as possible. This includes hair dryers, curling irons, flat irons and rollers. For me, this has been my biggest challenge! I've been blow drying my hair and using large rollers and flat irons to straighten my hair for a long time. Without them, I was left with a pouffy, frizzy mess! I thought that I couldn't live without their help. Boy, was I wrong! And if your hair is anything like mine, I think you'll be surprised too! Ok, ready for the secret......... AIR DRYING!!! When you air dry, especially in conjunction with a nice, conditioning cream, and ESPECIALLY WITHOUT MESSING WITH YOUR HAIR, you end up with hair that has little frizz and breakage. I wish I knew the exact science, but I don't. All I know is, even when I use the dryer slowly with a round brush, I still end up with a more coarse look and frizz. Most importantly though, over time, heat really can damage your hair, and one of the best reasons to stop the hair dyes and go gray, is to cultivate healthier hair! Why work against things? I understand that sometimes, you do need to use heated tools to achieve a nice look. I get it! So for me, what I've been doing lately, is starting with an air dry, and finishing up with just a bit of curl from a large barrel curling iron. The curling iron fixes any scraggly looking waves and helps my hairstyle look a tiny bit more finished. I was sure to find a curling iron that did not pull on my hair, and you can experiment to find out what the lowest heat setting is that will work for you. Moderation, that's all! If you are able to cut out the hair dryer, that will make a great difference in your hair's texture. I also recommend trying out heat-free days! On days like these, I air dry and then gently clip my hair back with a cute barrette. It just gives your hair a chance to rest. And there you have it! 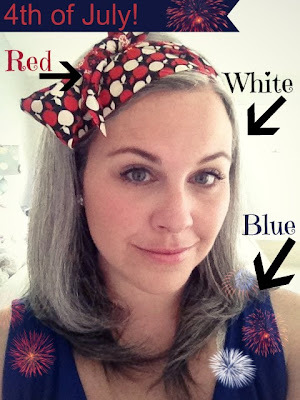 My top four tips for taking care of your gray hair's texture! I hope this was helpful! A BIG thank you, thank you soooooooooo much to everyone who has stopped by to read along with my gray hair posts. It means so much to me. And, to all of you who have taken the time to leave AMAZING, supportive, caring comments. I could never have done this without you! This post could not have come at a better time! :) I'm a little over 7 months into my transition and my hair has never been so unhealthy! I've already cut out heating tools, but I'll try to optimize the moisturizing! Thank you for writing!!! Oh gosh, I am so sorry. Sometimes we just never know how the silvers will behave! I just thought of one more thing....how about this....you might be able to find the following at your local store, but I suggest visiting a salon. You can ask for a clear or slightly blue tone glaze. Glazes help to add shine and smooth out your hair. They really don't add any color, unless you ask for a blue tone glaze, which takes away the yellow cast. In fact, I had a glaze once in the early springtime and it was great! They last 3-4 months. I would actually do it again! So yes, glazing might be great for you. Also, as much as I say "no heat", I have found that gently using a curling iron just on the top (without tugging), helps my fly-away hairs. I hope this helps Poupette. You are GORGEOUS just the way you are too! :) Thanks so much! Great blog post! We love featuring your stories on Revolution Gray! Please contact us at contact@revolutiongray.com. We've got a question for you. Thanks! Wow! It sure sounds like you've covered all of your bases..... a deva cut, the products, the curly girl methods.... I commend you for all of that work! It's interesting too, that you also found yourself to actually have wavy hair. I'm sure when you have your deva cut and let your stylist know that you want to option to wear your hair straight, she'll help you out. Oh, and if you liked your Giovanni product a bit better, I say go back to it! Everyone's hair reacts differently to different products. I'm sorry about the summer frizz. That can be so distressing. I know! My advice would be a light cream to put in your hair when wet, like the one I talk about in this post. Using my large barrel curling iron to lightly go over fizzy areas has helped a lot too. Good luck with everything. Enjoy that deva cut, how cool! Thank you for your comment and for reading! Hi Lauren, from one grey-haired gal to another, thanks so much for the tips. I am always on the lookout for different products for my wavy but all one length salt and pepper hair, and I am getting online to order some of your recommendations ASAP. It looks like out hair textures are very similar. Thanks! Oh wow! Hi Highland Fashionista!!!!!! You have a wonderful site. It's very nice to now meet you! Oh gosh, texture, it's a tricky one, huh? I'm glad to meet somebody with hair like mine. I hope the suggestions are helpful. Please keep in touch and let me know if you find anything that you like! Thank again for the comment! Hi Lauren, your face looks amazing in your photos, especially ones you are wearing pale green. After a year of transitioning I have finally got rid of my dye but I had to cut my hair and layer it. I love your length it's so pretty, how long did it take to grow ? I have found your posts to be so inspiring! I went five months dye free only to break down and redye during a moment of weakness. I am now starting over, no dye since 7/24/13. But you are my inspiration because you are beautiful! I hope my gray looks as great as yours when I'm all done. You're beautiful! I love your longer hair! My white hair is coming in much softer than I thought it would. You're scaring me with giving up heat! I let my hair air dry 2-3 times per week but have to finish it with an iron. I'm cheating a bit with growing out my white. I get highlights, but gave up the base color. Thanks for sharing your experience! It's very nice to meet you. Thanks for reading and for your comment. That is such a good question....should you consult your husband and four daughters before deciding whether you should go gray or not? Here's my two-cents. I always talk about everything with my husband. (My son was only six when I started to grow out my hair, so I didn't really discuss it with him.) I would imagine that you discuss a lot with your husband as well. He's going to notice pretty quickly if you start to grow out your hair. So, I think discussing it is a given. Or, even if you don't bring it up before hand, I'm sure it'll be a topic soon enough. The same goes for your daughters if they're at an age where they would notice or be interested. I'm sorry that this was a bit long-winded. I feel strongly about openness with family, but I also know from experience that it can be difficult for everybody to really know it will turn out ok. I was so lucky to have a supportive family from the get go. I don't think they knew how my hair would turn out, but they were supportive none-the-less . I hope if you decide that growingout your gray is the right thing for you, that you have some great "cheerleaders" behind you as well! We're always here for you too! Thank you so much again for your great question Amy. I appreciate it! Take care and Happy New Year!!! What a great blog!! Your silver hair is GORGEOUS! I like your blog, your hair looks much more beautiful now than when it was brown. 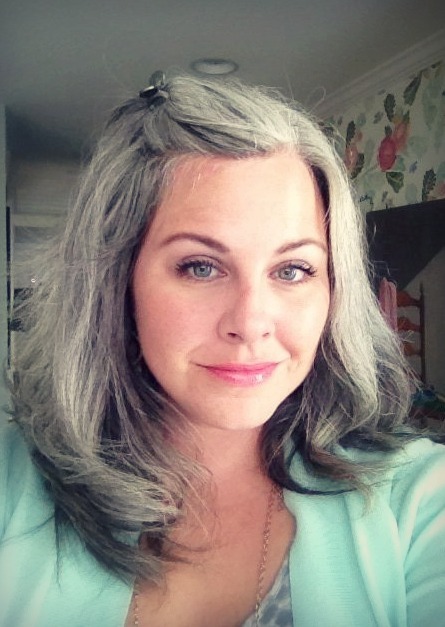 I think it's great that you have a website for those growing out their silver gray hair. My new growth that's grown in has some wiry grays. I'm not sure what to about it except I already eat healthy, drink water, I don't wash my hair everyday, I air dry my hair and stay away from sulfate shampoos. Any suggestions? Very fun reading your post and seeing photos of your lovely hair. I started growing out my grays a few years ago and have been very happy with the change. However, my experience has been that my grays are more coarse and frizzy than my hair was before. I do heat style, just so I look presentable, and feel pretty. But not too often. I also love to deep condition with coconut oil once in a while to soften, and use just a little on my dried and styled hair to keep it shiny and tame. My favorite 'blue' shampoo and conditioner are Pantene's version, which is hard to find but worth it. Thanks for the tips, and nice to 'meet' you! Thanks for you input. I am going to go search for the blue Pantene! I'm always looking to hear tips from others. Oh! And I love coconut oil as well, but after reading your comment, I am going to try and run a bit of pure coconut oil through my hair. My texture has changes too. The glaze that I spoke about in later posts, that's helped a lot with my frizz, but I definitely have some. Thank you again. I'm glad that you have happily embraced your grays as well! U have the most beautiful gray,such an inspiration! U look so young,how old are u? I'm 33 and have major salt n pepper...started when I was 20-21. Do u have cool skin tone? I always heard green was a no no with gray hair but the mint looks fantastic on you! So glad to have you here, and lots of luck!!!! Just wanted to say thank you for writing and for the inspiration and encouragement. Another early grayer here and finally about six months ago began to transition. I think I'm going to love it. There's been a few awkward phases but I'm actually excited to see what's been underneath all that dye and what my natural color REALLY is and to embrace that! Thanks so much for the nice comment. I'm really happy for you, I think you'll love your new gray too! Thanks so much for championing gray hair!! Your post here has given me some great ideas for managing my own gray locks and I will be giving them a try. (My hair is also wavy, gray, and easily frizzes when blow dried). I love love Moroccan oil by the way. It's the best. Here is something fabulous - there is a good chance that you new hair growth will have a texture very different from your current hair. I was thrilled to find that my new gray hair was 80% less frizzy than my dyed hair. It's softer than I could ever imagine. So, that makes drying and straight styles all the easier. So much luck to you KrisAnne. Know that I'll be thinking of you and sending cheer! Yes, please keep us posted! your blog is great and helpful! I am 2 months in, and am having minor anxiety if I look too closely! black hair coming in at my temples- what? I am a natural brunette... :). like you mention, I am afraid of the texture but keep telling myself it cannot be worse then the frazzled mess that has become my 'hair' because of dying and aging; am being positive though and friends are curious as to what it will look like...you and your hair look beautiful!I will check out the moisturizer you mentioned...thanks! I'm SO glad that you mentioned the dark hairs at your temples. WHAT are they I've thought! I have some darker hairs mixed in with my white hair, that is darker than my brown hair. My hairstylist told me that they are the "pepper" in "salt and pepper hair." Ok! I'll take that! Lol. She said that she plucks hers. I don't know what you are up to doing, but that is one option is there aren't a ton. My texture is so much nicer now. Sure I have some crazy hairs on the top of my head, but i just learned how to use styling tools and some cream or hair spray to tame them. It's all worth it in the end. Just play around with different products and see what works best for your hair type. You can have fun along the way! I hope this helps. Thank you so much again for you nice comment. Come back anytime if you have more questions! Bless your family. Keep making the cool videos.. Your hair is beautiful. Im sure your entire family loves your soft pleasant loveliness. Daniel. Aww. Thank you so much Daniel, for your encouraging, kind comment! I appreciate it! Hopefully when things are a bit less hectic, I will try "vlogging" again soon! Oh thank you, I LOVE comments and tips like yours! You know, I have been curious about the "No Poo" or "shampoo free" option for a while now. It's very intriguing to read about other people's great experiences with going shampoo free, like yours! So, thank you for sharing. I just might look into it some more! With your new blond highlights....this is just my experience, so it might not be what you are seeing..... It's very common for what hair to yellow a bit from everyday pollution in the air, UV rays and also, especially for me, the build up of hair products. I'm not sure if you use styling products like creams or oils, or use hot rollers or curling irons, but my styling cream and using heat styling, that always seems to turn my white hair yellow. Blond highlight sound GREAT! But I personally look better with white hair against my skin than blond or yellow. So, anyway, when I use certain shampoos that help to take out the product build-up, my blond patches go back to white. I think everybody is different though, that was just my experience. Thank you again for your comment lttwhivy, I really enjoyed it. I will read up more!!! Thanks again for sharing, I'll have to try them out! Love love love your posts. I am 4 months in to my silver locks and fortunately have recently become a 'stay-mostly-at-home' mom, so I don't have the "oh no" feeling at work in regards to growing out my gray!! I have come back over and over to your site, its very inspiring. IDK how old you are, but I'm only 36 and have been graying since 19!! I finally threw in the towel. I have noticed no one is as excited about my new venture, as I am. :/ I can only hope to pull it off as beautifully as you do! Being a "stay-at-home-mom" helped me get through this transition I think. You're right about not having to worry about that "oh no" feeling in an office or place of work. I'm 37, so we're close in age.I started graying young as well. It's hard, I know, but, I think you'll love your grays! Oh, and just like you, I was the most enthusiastic about growing out my hair, but then I was surprised to find that most of my family and friends came around and ended up being as excited as me! So hang in there. I'm sending you a big hug and lots of cheer. Thanks again Kelly! OK so I've TOTALLY bogarted your blog today lol BUT I had to share that I just came home with the Shea Moisture Deep Treatment Masque! So excited to try it tonight. Of course I only have a few inches of gray (5 months growth) but I want to help it along as best I can! I don't have curls so I got the 'Dry, Damaged Hair' version. I also found Pantene's Silver Expressions Shampoo which I'm also planning to dive into tonight! I also liked the Pantene too! Such fun stuff. Thanks for your super sweet and nice comments. I'm glad that you're here!!! I love your blog. I've had grey since I was 12 and I have been "bleaching sober" since October 2014. Now my head is almost all white! I have definitely noticed that the frizz is aging so I'll have to work harder to smooth everything down. Thank you so much for your comment. I am imagining that you new, white hair must be stunning! I'm always battling the frizz as well, but I have to say, as my new growth came in, it was 100 times healthier and less-frizzy than my old, processed hair. I hope you find this to be the same way for you too! Ah! I'm so excited! I didn't know that Shea Moisture made an Argan spray. Thank you, I'm going to try it! :) Yeah, I would say that their "Style Milk" has made a huge difference in my hair softness-wise. I hope you like it if you do get it. So Lauren, Great blog! I've been a silver sister for about 2 1/2 years and I love it. I find not only is it coarser and more curly, it's drier. I find I can wash it about once a week. (yeah, after about 5 to 6 days it needs to go up, but I can do it!) I have also tried to eliminate heat and use rollers (try going out in public with those babies--people look at you like you've grown another head!) My question, is I use a mixture of the AG silver shampoo and a very moisturizing shampoo. Do you think the blue shampoos are damaging/drying? I find going gray (and longer) hair very freeing! Love it! You keep up the good word! Wow, it sounds like you are doing great with your silver!!! I'm so glad to hear that you love it! Your question about purple shampoos is a great one. Are they drying to our hair? Well, I'm not a professional, but here is what I believe to be true, just like some regular shampoos are more or less drying, so are the purple ones. I think the more organic or "natural" you can go with your purple shampoos, the better. I think that sulphates are the chemicals that do the most drying. I'm not sure if it is sulphate-free, but many people love Aveda's Blue Malva shampoo. Thanks again for you comment and for stopping by! I have been searching myriad sites looking for how to tame my gray hair. My hair is virgin and I only dyed it a couple of times in my life. My problem is unique to those listed...My hair is baby fine and tends to be straight-ish. I am having a lot of challenges with my hair thinning (it may be baby fine but I always had a lot of it) and I think the thinning is due to 1) medications 2) blow drying, 3) sleeping weird on the side of my head and 4) age (I'm 62). I plan on trying Ittwhivy's hair tonic recipe. It sounds like it may help and I have many essential oils so I'll use the ones for reversing thinning hair (I'll do my research beforehand). I also (remarkably), decided just yesterday to let my hair air dry. The right side of my hair seems much more damaged than the left side. This is very helpful thank you for posting. My natural hair was very coarse and frizzy but my beautiful grey/silver/white hair is so soft and smooth ! I still have a little dark/natural hair at the back and can't wait for it to go grey like the rest of my hair. Hello Lauren! I just found your blog today while googling "growing out natural hair color" and such. I've been having my hair professionally colored for at least 15 years, before that, I'd been dying it myself since I was 18. I've been every shade of intense red, violet, and mahogany brown. Well just recently I decided that I want to grow out my natural hair color--why should I be ashamed of my hair color? It looks like I have a few grey hairs but I am okay with that. So while at my last visit to my hairstylist for a cut and my final color, I felt a bit weird when I left the salon. I'm very excited about growing out my natural hair, and asked what color to use today that will blend in with my natural hair. After she mentioned that it will take about 4 more times to really cancel the red and look close to my natural color, I had to stress to her that I want to grow out my natural hair color, not just get it dyed to look like my natural color. She told me before coloring it that my hair looked about 50% grey, which I thought was a bit of an odd since I only had about a half inch of natural color since my last visit. My natural color is a medium brown, and yes I noticed a little bit of hair turning grey, but I am fine with that. I just don't understand why my stylist is reacting so weird about it. She said something like "I don't think you are gonna like it." Any advice? Why should we be ashamed of our natural color? I stressed that my next visit will be just a cut, but she seems so determined that I should continue to color my hair. I really want to embrace the way I am, and if I have grey hair, then that's what is meant to be. I think your hair looks beautiful by the way. Any advice your or your followers have is much appreciated! Hang in there Dee Dee. I have no doubt that you can do it!!!! A lot of times people just need some time to come around and see that gray can be great!!! I'm so glad that you're here and a BIG congratulations on growing out your hair!!! I'm in an all out panic over my hair. I've been growing mine out now for 3 1/2 years. I'm almost done with cutting all the color out. Then this weekend we go camping with the cub scouts and I saw a picture of myself with my hair pulled back. I wanted to cry. I looked terrible. Old. I was horrified. I made an appointment with my hair dresser to do color this Friday and I don't want to color it but I cannot look like a grandmother to my 6 1/2 yr old son. Ugh! My heart goes out to you because I know this is a emotional decision, especially because you have 3.5 years worth of effort in! I was having a moment a couple of months ago where I was so tired of feeling and looking older from the gray. I almost caved and tried a new organic dye. I gave myself a few week to think about it, and after a while, I realized that the gray IS me and that I personally never wanted to go through the grow-out again, so I stayed gray! I reminded myself and this might be the same for you, that with our gray, we usually need to pay more attention to the other components of our outside appearance, just to brighten ourselves up and help us look as youthful as we can. When you were camping with the Cub Scouts, maybe that was a time when you look much more casual and laid back than a night out. Maybe with your hair down and warm makeup and a youthful, stylish outfit, I would be you look much younger. That might be part of why the photo pulled at your heart. Maybe it wasn't an accurate representation of how you look to the world on a day to day basis? I’m in the same boat, but I just can’t go back to coloring. I have a 6 and a half year old boy, too.